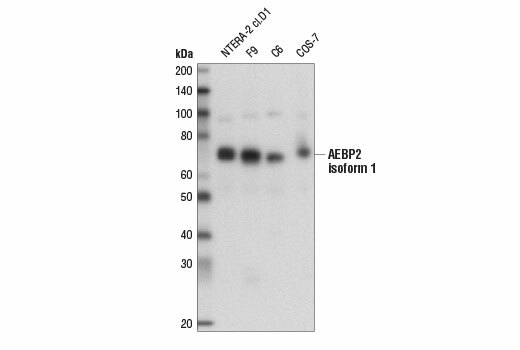 Western blot analysis of extracts from various cell lines using AEBP2 (D7C6X) Rabbit mAb. Western blot analysis of extracts from HeLa cells, transfected with 100 nM SignalSilence® Control siRNA (Unconjugated) #6568 (-), SignalSilence® AEBP2 siRNA I #14711 (+), or SignalSilence® AEBP2 siRNA II #14713 (+), using AEBP2 (D7C6X) Rabbit mAb (upper) or α-Actinin (D6F6) XP® Rabbit mAb #6487 (lower). The AEBP2 (D7C6X) Rabbit mAb confirms silencing of AEBP2 expression, while the α-Actinin (D6F6) XP® Rabbit mAb is used as a loading control. Immunoprecipitation of AEBP2 from NCCIT cell extracts using Rabbit (DA1E) mAb IgG XP® Isotype Control #3900 (lane 2) or AEBP2 (D7C6X) Rabbit mAb (lane 3). Lane 1 is 10% input. 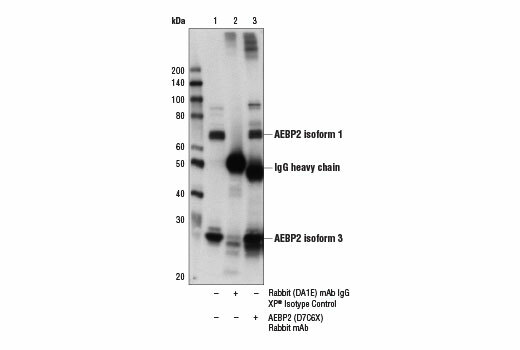 Western blot analysis was performed using AEBP2 (D7C6X) Rabbit mAb. Chromatin immunoprecipitations were performed with cross-linked chromatin from NCCIT cells and either JARID2 (D6M9X) Rabbit mAb #13594, CBX8 (D2O8C) Rabbit mAb #14696, or AEBP2 (D7C6X) Rabbit mAb, using SimpleChIP® Plus Enzymatic Chromatin IP Kit (Magnetic Beads) #9005. DNA Libraries were prepared using SimpleChIP® ChIP-seq DNA Library Prep Kit for Illumina® #56795. All of JARID2, CBX8, and AEBP2 are known to associate with PRC complexes. 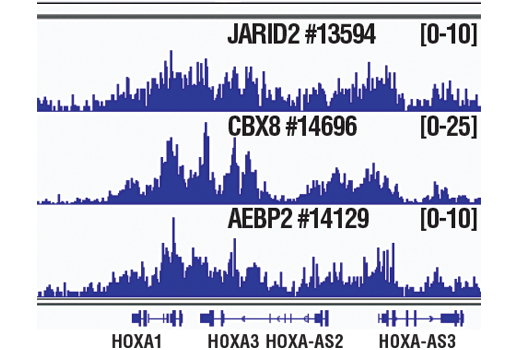 The figure shows binding of JARID2, CBX8, and AEBP2 across HOXA gene region, known target genes of JARID2, CBX8, and AEBP2 (see additional figure containing ChIP-qPCR data). For additional ChIP-seq tracks, please download the product data sheet. Chromatin immunoprecipitations were performed with cross-linked chromatin from NCCIT cells and either AEBP2 (D7C6X) Rabbit mAb or Normal Rabbit IgG #2729 using SimpleChIP® Enzymatic Chromatin IP Kit (Magnetic Beads) #9003. The enriched DNA was quantified by real-time PCR using SimpleChIP® Human HoxA1 Intron 1 Primers #7707, SimpleChIP® Human HoxA2 Promoter Primers #5517, and SimpleChIP® Human α Satellite Repeat Primers #4486. The amount of immunoprecipitated DNA in each sample is represented as signal relative to the total amount of input chromatin, which is equivalent to one.
! This ! signifies an important step in the protocol regarding volume changes based on the number of immunoprecipitation preparations (IP preps). One IP prep is defined as 4 x 106 tissue cultured cells or 25 mg or disaggregated tissue. When harvesting tissue, remove unwanted material such as fat and necrotic material from the sample. Tissue can then be processed and cross-linked immediately, or frozen on dry ice and stored at -80°C for processing later. For optimal chromatin yield and ChIP results, use 25 mg of tissue for each immunoprecipitation to be performed. The chromatin yield does vary between tissue types and some tissues may require more than 25 mg for each immunoprecipitation. Please see Appendix A for more information regarding the expected chromatin yield for different types of tissue. One additional chromatin sample should be processed for Analysis of Chromatin Digestion and Concentration (Section IV). If desired, five additional chromatin samples should be processed for Optimization of Chromatin Digestion (Appendix B). Weigh the fresh or frozen tissue sample. Use 25 mg of tissue for each IP to be performed (at least 75 mg of tissue is required for one experiment in order to include positive and negative controls). Centrifuge tissue at 500 x g in a benchtop centrifuge for 5 min at 4°C. Repeat centrifugation at 500 x g in a benchtop centrifuge for 5 min at 4°C. Remove supernatant and resuspend tissue in 1 ml PBS + PIC per 25 mg tissue and store on ice. Disaggregate tissue into single-cell suspension using a Medimachine (Part B) or Dounce homogenizer (Part C). (SAFE STOP) Alternatively, samples may be stored at -80°C before disaggregation for up to 3 months. Centrifuge cells at 2,000 x g in a bench top centrifuge for 5 min at 4°C. Remove supernatant from cells and continue with Nuclei Preparation and Chromatin Digestion (Section III). Transfer cell suspension to a 15 ml conical tube and centrifuge at 2,000 x g in a benchtop centrifuge for 5 min at 4°C. For optimal ChIP results, use approximately 4 X 106 cells for each immunoprecipitation to be performed (at least 12 X 106 cells are required in order to include positive and negative controls). For HeLa cells, one IP is equivalent to half of a 15 cm culture dish containing cells that are 90% confluent in 20 ml of growth medium. One additional sample should be processed for Analysis of Chromatin Digestion and Concentration (Section IV). Since every cell type is different, we recommend including one extra dish of cells in experiment to be used for determination of cell number using a hemocytometer or cell counter. Prepare 540 µl of 37% formaldehyde per 15 cm dish (or 20 ml suspension cells) to be processed and keep at room temperature. Use fresh formaldehyde that is not past the manufacturer's expiration date. For suspension cells, transfer cells to a 50 ml conical tube, centrifuge at 500 x g in a benchtop centrifuge 5 min at 4°C and wash pellet two times with 20 ml ice-cold PBS. Remove supernatant and immediately continue with Nuclei Preparation and Chromatin Digestion (Section III). Centrifuge cells at 2,000 x g in a benchtop centrifuge for 5 min at 4°C. Remove supernatant and immediately continue with Nuclei Preparation and Chromatin Digestion (Section III). (SAFE STOP) Alternatively samples may be stored at -80°C for up to 3 months. Transfer supernatant to a new tube. (SAFE STOP) This is the cross-linked chromatin preparation, which should be stored at -80°C until further use. Remove 50 µl of the chromatin preparation for Analysis of Chromatin Digestion and Concentration (Section IV). This 50 µl sample may be stored at -20°C overnight. Purify DNA from samples using DNA purification spin columns as described in Section VII. (SAFE STOP) DNA may be stored at -20°C for up to 6 months. Immediately proceed to Section VII. (SAFE STOP) Alternatively, samples can be stored at -20°C for up to 4 days. However, to avoid formation of a precipitate, be sure to warm samples to room temperature before adding DNA Binding Buffer #10007 (Section VII, Step 1). Centrifuge at 18,000 x g in a microcentrifuge for 30 sec to elute DNA. Remove and discard DNA spin column. Eluate is now purified DNA. (SAFE STOP) Samples can be stored at -20°C. Observe which of the digestion conditions produces DNA in the desired range of 150-900 base pairs (1 to 5 nucleosomes). The volume of diluted Micrococcal Nuclease that produces the desired size of DNA fragments using this optimization protocol is equivalent to 10 times the volume of Micrococcal Nuclease stock that should be added to one immunoprecipitation preparation (25 mg of disaggregated tissue cells or 4 X 106 tissue culture cells) to produce the desired size of DNA fragments. For example, if 5 µl of diluted Micrococcal Nuclease produces DNA fragments of 150-900 base pairs in this protocol, then 0.5 µl of stock Micrococcal Nuclease should be added to one IP prep during the digestion of chromatin in Section III. For optimal ChIP and ChIP-seq results, use 20 μl of antibody and 10 μg of chromatin (approximately 4 x 106 cells) per IP. This antibody has been validated using SimpleChIP® Enzymatic Chromatin IP Kits. 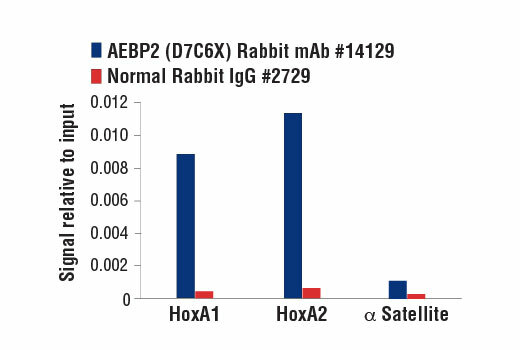 AEBP2 (D7C6X) Rabbit mAb recognizes endogenous levels of total AEBP2 protein. Monoclonal antibody is produced by immunizing animals with a synthetic peptide corresponding to residues surrounding Leu345 of human AEBP2 protein. Polycomb group (PcG) proteins contribute to the maintenance of cell identity, stem cell self-renewal, cell cycle regulation, and oncogenesis by maintaining the silenced state of genes that promote cell lineage specification, cell death, and cell-cycle arrest (1-4). PcG proteins exist in two complexes that cooperate to maintain long-term gene silencing through epigenetic chromatin modifications. The PRC2 (EZH2-EED) complex is recruited to genes by DNA-binding transcription factors and methylates histone H3 on Lys27. Methylation of Lys27 facilitates the recruitment of the PRC1 complex, which ubiquitinylates histone H2A on Lys119 (5). Suppressor of Zeste 12 (SUZ12) is an obligate component of the PRC2 complex, which together with EZH2 and EED is absolutely required for histone methyltransferase activity of the protein complex (6). 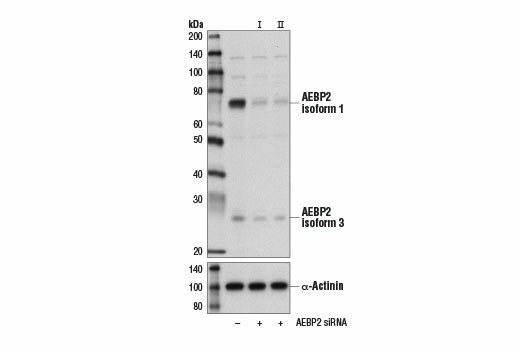 The zinc finger AE binding protein 2 (AEBP2) is another integral component of the PRC2 complex. Addition of AEBP2 to the PRC2 core complex (EZH2-EED-SUZ12) enhances histone H3 Lys27 methyltransferase activity on nucleosomal substrates in vitro, which may be mediated in part by three AEBP2 DNA-binding zinc finger domains (5,7). AEBP2-mediated enhancement of enzymatic activity is greater on nucleosomal substrates that contain mono-ubiquitinated histone H2A Lys119, which suggests that AEBP2 may target PRC2 complexes in vivo through binding to DNA and mono-ubiquitinated histone H2A Lys119 (8). Boyer, L.A. et al. (2006) Nature 441, 349-53. Cao, R. et al. (2002) Science 298, 1039-43. Müller, J. et al. (2002) Cell 111, 197-208. Cao, R. and Zhang, Y. (2004) Mol Cell 15, 57-67. Wang, H. et al. (2004) Nature 431, 873-8. Kim, H. et al. (2009) Nucleic Acids Res 37, 2940-50. Kalb, R. et al. (2014) Nat Struct Mol Biol 21, 569-71.